← Caption Contest 67: BRAKASH! 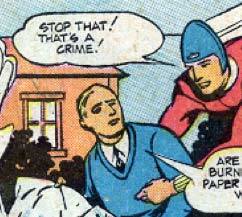 I don’t know, I kind of like the idea of superheroes going around saying “Stop that! that’s a crime!” Sort of like SuperNanny or something. This whole beat-them-with-my-bare-hands sort of thing seems so touchy feely. I had actually failed to notice the phallic imagery of the helmet until you mentioned the helmet thing, Senor Jeff. Thank you for making every Bulletman panel that much dirtier.